SAVANNAH, Ga., Feb. 4, 2019 - At the Georgia Foreign Trade Conference today, Stuart Countess, chief administrative officer and vice president of Kia Motors Manufacturing Georgia, announced that the Telluride, its new 8-person SUV, will begin crossing the Port of Brunswick's docks for global markets this month. "The launch of the Kia Telluride, our largest and most refined SUV to date, will be a monumental achievement for KMMG," said Countess. "From the support we receive from GPA with our inbound parts from our global supply chain to supporting our export of finished vehicles to current and future markets, GPA will play an important role." Through vertical integration - parts in via Savannah, autos out via Brunswick - Kia takes advantage of Georgia's extensive road and rail infrastructure, as well as its broader network of shipping line services. Kia has been a valued customer for the Port of Savannah since 2009, when KMMG first began producing vehicles for the domestic U.S. market in West Point, Ga.," said Georgia Ports Authority Executive Director Griff Lynch. "Their decision to export the Telluride via Brunswick highlights the benefits of having North America's largest container port and largest autoport within 85 miles of each other. Georgia provides the total package when it comes to auto manufacturing and global distribution." Countess, Mark Boucher, director of vehicle logistics for the Volkswagen Group of America, and Gerry Lee, vice president of planning and logistics for Subaru of America, took part in the GFTC automotive panel, titled "What Challenges Does the North American Auto Industry Face in 2019?" One of the keys to success, the experts agreed, is a reliable and cost-efficient supply chain. Volkswagen's plant in Chattanooga receives parts from the Port of Savannah and currently exports a small number of the Passat and Atlas models via Brunswick. Boucher said VW will soon launch a new version of the Passat and the company has "robust plans for delivering the Atlas to more than 30 export destinations in 2019." In addition, Boucher said the manufacturer was making an $800 million investment to manufacture and export electric vehicles by 2022. Jay Johnson, intercontinental logistics specialist for Volkswagen, oversees the import of parts supplying the Chattanooga plant. "We continue to build our partnership as our needs change and as the GPA continues to add more logistic values by improvements at the Savannah Port, as well as adding the Appalachian Regional Port," Johnson said. "GPA has proven over and over again through the years their ability to assist us on many hard and difficult occasions. We are thankful to have a partnership where sometimes you feel as if you are their only customer." Johnson added: "As a service provider, the Port of Savannah continually performs as an industry leader on many levels, especially when providing SSL Carriers, IT ability, discharge times, truck turn times and driver assistance. Their position on continual improvements assists our Chattanooga operations daily with a smooth, seamless supply chain." Lee said Subaru relies on the GPA to import its Forester, Crosstrek, WRX and BRZ models. 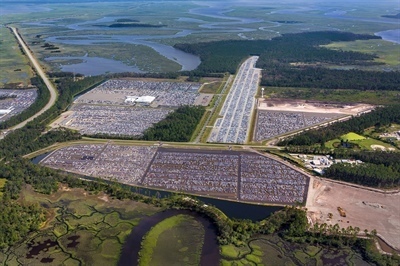 "The Port of Brunswick is the right fit for Subaru's vehicle supply chain because it is a great location to support the retailers in our Atlanta and Orlando sales zones." Another example of vertical integration among GPA's automotive customers is General Motors' Acadia. The Port of Savannah supplies GM's Spring Hill, Tenn., plant and, starting this year, will export approximately 12,000 Acadia SUVs through Ocean Terminal.